The Aragón family is one of Europe’s most prolific clown dynasties. A Spanish family with French circus ancestry, it has produced five generations of funnymen, some of whom have become major circus stars in Spain as well as abroad: Pompoff y Thedy, arguably the greatest Spanish clown duet of their generation, which morphed into The Pompoff Thedy Family with the third and fourth generations and have enjoyed an outstanding international career; and Gaby, Fofó y Miliki, from the fourth generation, who became major stars on Spanish television. The founder of the dynasty, Gabriel Aragón Gomez, was a former seminarian who had “run away and joined the circus,” and eventually became a clown under the name of Pepino. Gabriel married the equestrienneA female equestrian, or horse trainer, horse presenter, or acrobat on horseback. Virginie Foureaux (?-1930), who came from one of France’s oldest circus dynasties: the Grand Cirque Foureaux had been established by Jacques Foureaux in 1805, and her family had been playing the fairgrounds long before the modern circus was created by Philip Astley in 1770. Gabriel and Virginie had fifteen children—and four sons among them. Little has been recorded of Arturo, the elder, who was probably significantly older than his more famous brothers: Emilio (later known as Emig—?-1946), Teodoro (later known as Thedy—1885-1974), and José-María (later known as Pompoff—1886-1970). At the end of the nineteenth century, Gabriel Aragón created a successful clown duet with his elder son Arturo. As Pepino y Tonino (Arturo’s stage name), they acquired a strong reputation in Spain and all over Europe. Gabriel’s other sons participated in their father’s act as they grew up (the act was sometimes billed as the Aragón Family), but in 1909, José-María and Teodoro decided to take their independence and create a clown act of their own. They flopped: At twenty-four and twenty-two respectively, they probably still lacked the maturity necessary to carry a comedy act by themselves—especially in a country that appreciated good clowning, and where great clowns were aplenty! The brothers split, and Teodoro went to the United States, where he worked in an acrobatic act. 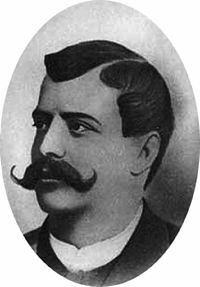 José-María became a small-time circus producer, and toured a modest show in neighboring Morocco, then under the joint rule of Spain and France. In 1912, Morocco became a French protectorate, and José-María ended his circus tours in that country. 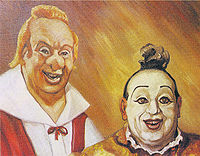 The following year, Teodoro returned from his engagement in the United States, and he and José-María decided to revive their clown act.They debuted in 1913 in Valencia, and this time, the Hermanos Aragón (the Brothers Aragon), as they were originally known, who had apparently gained valuable life experience and maturity, met with unmitigated success. They soon changed their name for Pompoff y Thedy: José-María was Pompoff, the classic whiteface clownGeneric term for all clowns and augustes. '''Specific:''' In Europe, the elegant, whiteface character who plays the role of the straight man to the Auguste in a clown team., and Teodoro was Thedy, the augusteIn a classic European clown team, the comic, red-nosed character, as opposed to the elegant, whiteface Clown.. Their association would last a half-century, and Pompoff y Thedy would become Spain’s most celebrated clowns, their fame spreading all over Europe and eventually to America. During the 1920s, the duo became a trio, with the addition of their brother Emilio, who became the second augusteIn a classic European clown team, the comic, red-nosed character, as opposed to the elegant, whiteface Clown.. Under the stage name of Emig, Emilio created a "Cuban" augusteIn a classic European clown team, the comic, red-nosed character, as opposed to the elegant, whiteface Clown. character that he played in blackface, in the American old minstrel tradition. José-María had two sons, José and Victor, and Teodoro had one son, Emilio. In the 1930s, after Emig had left the trio, José (1912-1993), known by the improbable stage name of Nabucodonosorcito (or Pepe…) and Emilio (known as Zampabollos) were added to the act. Together, the family continued their brilliant European career, until it became constrained to Spain with the advent of WWII. In 1939, Pompoff, Thedy, Nabucodonosorcito and Zampabollos starred in a short movie directed by Octavio F. Roces, and titled Pompoff, Thedy y Compañía, which was shown as an opener with Carlos Fernández Cuenca’s feature film, Leyenda Rota. In America, Pompoff, Thedy, José and Emilio, and José's brother, Victor, were billed as Pompoff, Thedy & Family, Spain’s Royal Family of Comedy. Their stage appearance changed drastically: Pompoff’s European clown characteristics—his whiteface and his ornate, sequined costume—disappeared to give way to black tails and white tie, an outfit adopted by all members of the act, with various degrees of fitting for José and Emilio. Their augusteIn a classic European clown team, the comic, red-nosed character, as opposed to the elegant, whiteface Clown. make-ups, too, although never very strong (following in this the European tradition), became simplified to a bare minimum; only the augustes’ animated wigs and bulbous noses differentiated them from conventional vaudeville comedians. 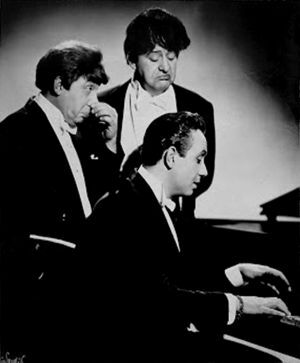 Pompoff and Thedy worked mostly, at first, as musical accompanists to the clown trio animated by their sons, José and Emilio, who had been joined by Victor, José's younger brother. 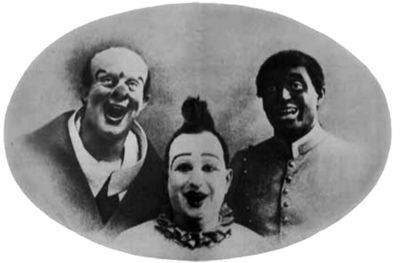 Victor worked as their straight man, while Emilio was the principal augusteIn a classic European clown team, the comic, red-nosed character, as opposed to the elegant, whiteface Clown. to his brother José—whose mute character was reminiscent of Harpo Marx’s, his evident inspiration. Eventually, Pompoff and Thedy retired from the act, which became a trio known as The Pompoff Thedy Family, with Emilio, José and Victor. Over the years, what was left of their augusteIn a classic European clown team, the comic, red-nosed character, as opposed to the elegant, whiteface Clown. make-ups disappeared, and their costumes became better fitted—yet they remained unmistakably a trio of clowns. 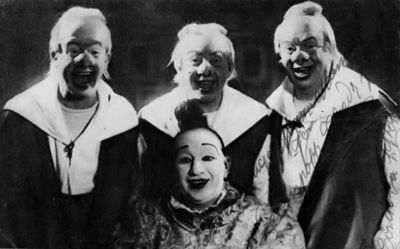 Their physical appearance, however, had a special cachet and was quite original, even compared to other European clowns; it allowed them to fit more efficiently on the American variety scene of the time, which still kept a few glorious remnants of the defunct Vaudeville era. The Pompoff Thedy Family were featured in many variety shows, including the highly successful Judy Garland’s show in 1956-57 at the legendary Palace Theatre on Broadway (which was then celebrating its reopening), and the long-running Folies Bergère revue at the Tropicana Hotel in Las Vegas. On television, they appeared on several Ed Sullivan Show, the most popular variety show on American television in the 1960-70s; on Jackie Gleason’s American Scene Magazine on CBS; on NBC’s The Kraft Music Hall; and on ABC’s The Hollywood Palace, among others. In 1967, the family returned to Spain and settled in Madrid. That year also marked José-María and Teodoro official farewell to the ring: Assisted by José, Emilio and Victor, the still beloved Pompoff and Thedy gave their last performance at Madrid’s legendary Circo Price, in their traditional clown regalia, Pompoff in whiteface and sequined costume, and Thedy in traditional augusteIn a classic European clown team, the comic, red-nosed character, as opposed to the elegant, whiteface Clown. make-up. José-María died in Madrid, his birthplace, three years later, in 1970. Teodoro followed him on December 30, 1974 (he had been born in Nice, France, on February 25, 1886). Both are buried in Madrid. The Pompoff Thedy Family trio, on the other hand, resumed their European career, working mostly in variety with a few appearances in circus buildings. In 1979, they participated in the 6th International Circus Festival of Monte Carlo, where they obtained a great success, unfortunately eclipsed by the triumph of another great clown who did most of his career in variety, George Carl. It was in fact the first time that clowns had been truly successful at the Festival (if one excepts Charlie Rivel at the first festival, whose "Gold Clown" award was mostly a tribute to a long and exceptionally brilliant career that was by then on the vane). Yet the Pompoff Thedy Family were sadly forgotten by the Jury of the festival, enthralled as it was by the remarkable and unexpected performance of George Carl. After Emilio left the act (he died in Chicago, where he had retired, on November 28, 1985), Victor took his place, with his young and talented son, Sandro, acting as the trio’s straight man. By then, José-Nabucodonosorcito-Pepe was in his seventies, still efficient, funny, and immensely loveable, still the central comic character of the Pompoff Thedy Family—who had lost none of their remarkable comic and musical talents over the many years they spent creating laughter in Europe and America. José Aragón (his full name was José Aragón Hipkins) eventually retired from the stage and the ring in the early 1980s. In 1991, he was presented with the Gran Premio del Circo (Spain’s National Circus Award) by the Spanish Ministry of Culture, as a tribute to his long and exceptional career. He died in Madrid on March 22, 1993, at age eighty-one. With his passing, the Pompoff Thedy Family disappeared forever.